Iran’s foreign ministry on Wednesday reiterated its support for Hamas and other anti-Israel terrorist groups and said that aiding those who "stand against the Zionist regime is a principle of Iran’s policy." 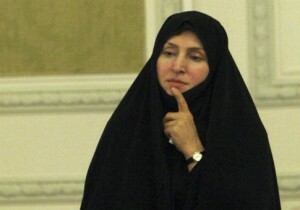 "Iran’s support for all resistance groups continues similar to the past," said Marzieh Afkham, a spokeswoman for Iran’s foreign ministry, to reporters in Tehran when asked whether the country’s position on Hamas had shifted. Afkham went on to stress that "supporting members of the resistance front and those who stand against the Zionist regime is a principle of Iran’s policy," according to Iran’s state-controlled Fars News Agency. These terrorist groups, with Iran’s support, will "stand on the frontline of war against the Zionist regime [and] would maintain their unity and integrity." "To sell the deal, supporters of the JCPOA distort the facts about the Iranian regime’s intention and plan to annihilate Israel," said Saeed Ghasseminejad, an Iran expert at the Foundation for Defense of Democracies. "All factions of the Islamic regime in Iran firmly believe that Israel must be destroyed, they just have different opinions about the best way to reach this goal." Iran will "continue providing weapons to support the Middle Eastern countries fighting terrorism," Javad Zarif, Iran’s foreign minister, was recently quoted as saying by Iran’s state-controlled press. Following the nuclear deal, Iran will "preserve its defensive capabilities and send weapons to its regional allies," according to Zarif. "Iran’s various supports for Palestine have been precious, abundant and greatly influenced the Palestinian resistance," Marzouk is reported to have said earlier this year. More than 70 members of the Iranian parliament recently petitioned President Hassan Rouhani to increase "Iranian support for the regional resistance front after the nuclear agreement," according to the report. These Iranian lawmakers "called on the president to use the ministries of defense and foreign affairs to send aid to the Palestinians in accordance with instructions from the Supreme Leader to arm the Palestinians in the West Bank." Another top Iranian national security official, Javad Karimi Qoddousi, demanded this month that "all the senior Iranian officials … support aid for the Palestinian people and the resistance front so that the nuclear agreement [is not] exploited to strengthen Israel’s security."